Phast Phreddie the Boogaloo Omnibus and Alberto de Wowsville swing at the Jupiter Disco! On Saturday March 30, Phast Phreddie the Boogaloo Omnibus hosted another happy hour event at the Jupiter Disco. But this was not just another Happy Hour in Gotham City. This one featured Alberto de Wows!ville, our Spanish friend who now lives in Berlin. He was in town for about ten days so we let him horn in on our DJ action at the Jupe. Thus, instead of the usual happy hour jazz The Boog plays at these events, a program of outrageous rockin’ jams was in order to create Jumpin’ on Jupiter. 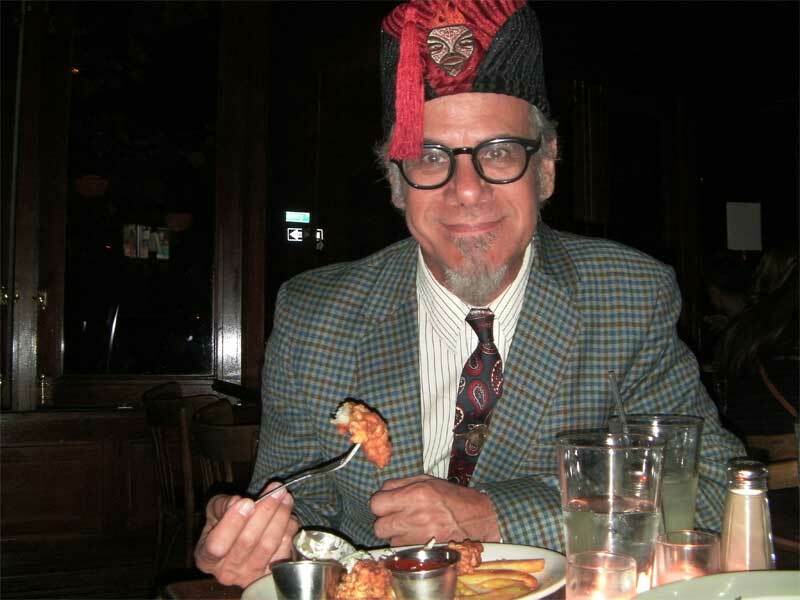 The Boogaloo Bag writers first met Señor Alberto when he lived in New York City about ten or so years ago. He ran a groovy record store called Wows!ville on Second Avenue in Manhattan. The store stocked all the boss teen pop discs, including all the Norton Records releases and odd Bo Diddley albums. There was a giant Rat Fink in the corner. Also, Señor Alberto and his pal Señor Dos Platos hosted a wild DJ night in the basement of Niagara in the East Village every week. That was a wild scene. However, all good things come to an end. Señor Alberto had to close his store and move back to Europe. Eventually, he settled in Berlin where he founded a whole new Wows!ville scene that includes a record store, a night club and a pizza shop! The cat is moguling! Alberto de Wowsville responds to the Bat Signal at the Jupiter Disco! So Señor Alberto was coming back to town, looking for DJ nights. The Boog was happy to let him swing at the Jupe. Several years ago, Alberto set The Boog up with a couple cool DJ gigs in Berlin; this was payback. Everyone was excited about this night. ¡No problemo! Phast Phreddie the Boogaloo Omnibus packed an especially bitchen box of old 45s and let Señor Alberto dig in and spin whatever he wanted. Everything worked out fine. Along with Señor Alberto was his gal pal Miss Kaja–a woman of the world if ever there was one. She is from Sweden, but has lived in Thailand and California, and now Berlin. 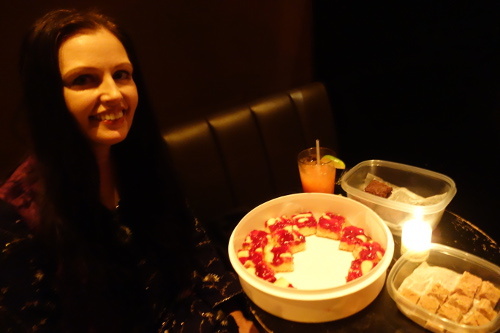 Plus, Miss Nancy made some fabulous maple and chocolate fudge with little Bat emblems attached to them (after all, we were at The Jupe and the Bat Signal was in full force) as well as her signature vegan brownies. So the evening was saved. Folks came from far and wide and to dig Señor Alberto’s scene. Alberto de Wowsville and Yana Lil Jerk swing at the Jupiter Disco! 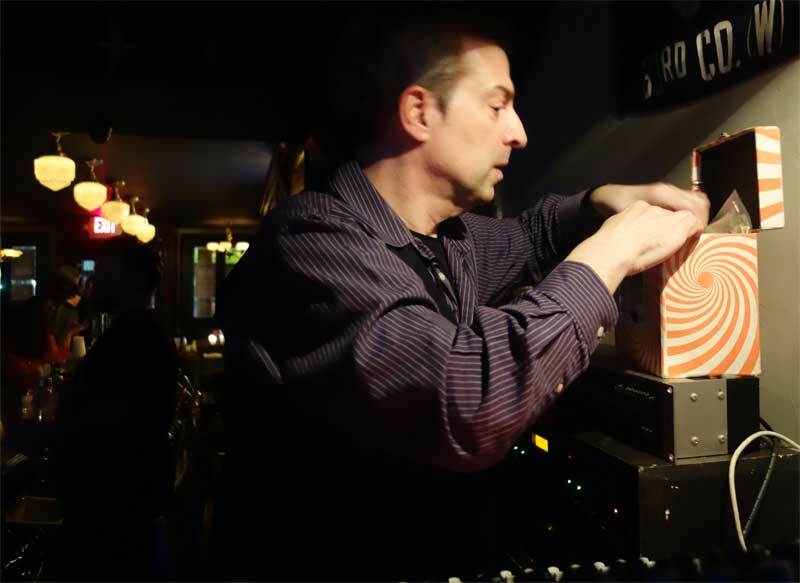 As this portion of the evening winds down around 9:30pm or so, The Boog usually digs out some hot funk jams in order to make a fairly smooth transition between the groovy Gotham City scene and the late night disco DJ at the Jupe. However, the follow-up DJs showed up late–well after the B.T. Express record was played, which is nearly six minutes long, allowing time for the other DJ to set up and The Boog to set down. The Boog ran out of the funky stuff and had to make due with a few soul & R&B records until he was relieved. The night was still early, so Miss Nancy and The Boog headed over to the Gran Torino (aka Diviera Drive) for a mambo night hosted by our friends DJ Rata and Tony Salvaje. A band called Lapachamambo played and we dug that quite a bit. The Boogaloo Bag writers urge its readers to dig it when it comes to your town. None of these records are for sale. Some of them have links to the youtubes for you to dig. 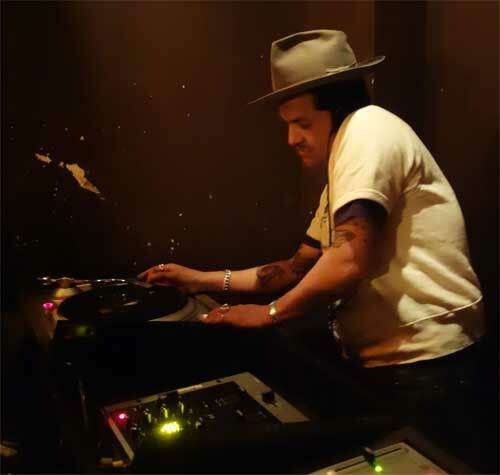 On Saturday February 23, Phast Phreddie the Boogaloo Omnibus was the DJ at another happy hour event at the Jupiter Disco–East Williamsburg’s best-named night club. Due to the mysterious appearance of the Bat Signal, these early evening events are now referred to as Happy Hour in Gotham City. This is how Phast Phreddie constructs an audio environment that compliments the imbibing of frothy beverages: During the early part of the evening the scene is set with Mod jazz, organ grooves, reggae, provocative pop and mid-tempo soul records. The beat picks up as the evening moves along, until the final hour or so when heavy, heavy funk records are played, leading up to the ten o’clock disco DJ. On this evening, The Phast Man’s personal night did not end at ten, as he was also scheduled to DJ a later event. Oh, and let’s not forget the most excellent Bat Cookies baked by Miss Nancy Gardner! Those were good! Although the evening started slowly, the Jupiter Disco attracted a nice crowd and folks were bopping along with the groovy music emanating from the club’s excellent sound system. Attendees got down on the sounds and chowed down on Miss Nancy’s cookies and vegan brownies. These nights are absolutely swingin’ and all Boogaloo Bag readers should dig it (next Happy Hour in Gotham City will be March 30th). Big Eugene and Matt Clarke swing at Happy Hour in Gotham City! At ten o’clock, the next DJ arrived and set up her gear in a professional manner as The Boog set down. However, the evening was not yet over–two more places to go! 1) The Grab This! benefit at Milo’s Yard hosted by our friend Drew Redmond. 2) Quitty’s birthday at Easy Lover in Williamsburg with our friend Nogood Nick leading the charge. Both events were scheduled to run late, so there should be time–if there is energy!–to hit them both. Artist Camille Olivia, Phast Phreddie the Boogaloo Omnibus, Drew Redmond and Miss Hap swing at the Grab This! benefit. The Boogaloo Bag writers hit the benefit first because Phast Phreddie was scheduled to spin a few records and it was closer to The Jupe. Mr. Redmond lined up a full crew of DJs to swing, including Mikey Post, Grace of Spades, Classy Chris and Miss Hap. Luckily, there were plenty of Bat Cookies for this event also! We walked in as Grace of Spades was playing some great reggae records–its what she does; Classy Chris followed with his specialty, mid-tempo soul records; Miss Hap also played reggae records (she totally gassed the Boogaloo Bag writers when she played “Rock Steady” by The Marvels, then turned it over and played “Be My Baby!”); and Mikey Post played some soul and funk records from the sixties and seventies (was that an ESG record?). 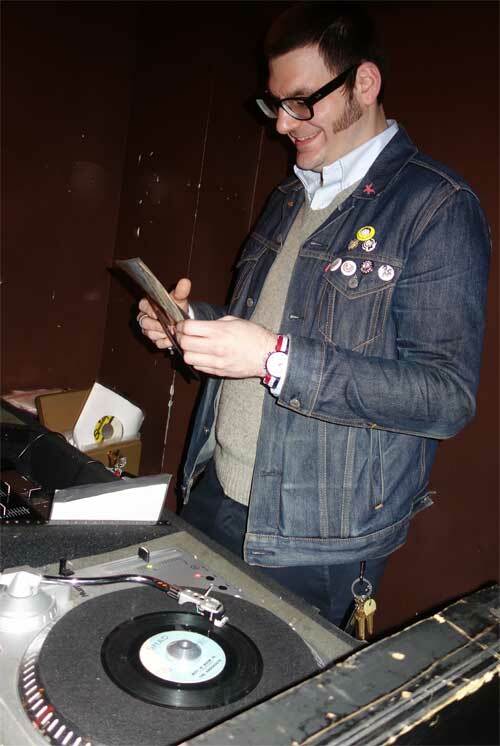 Since the event was arranged to benefit groups that support women’s causes, Drew Redmond asked the DJs to play records made by women. It was so noted on the poster, but The Boog did not get that memo (or at least he didn’t read the poster!). Once he was informed of this theme, he looked through his records in order to dig out selections that would be appropriate–and found some! As for the benefit, money was made–mostly via a passed hat and a piece of the bar– and it went to Planned Parenthood and the pro-choice organization NARAL NY. By the time the Boogaloo Bag writers, Miss Nancy and Phast Phreddie said their goodbyes at Milo’s Yard, it was late, late, late. It was raining. The M Train was just a few blocks away. It was just too easy to hop onto it and head home, instead of walking three times as far and waiting around for an L Train shuttle in order to make the scene at Quitty’s birthday party. Miss Quitty is one of our favorite people and we were saddened that we couldn’t be there to wish her well in person on this, her special night. So we hope she accepts our apology and best wishes as noted in this blog post. None of the records listed here are for sale. Some of them have links to the youtubes clips. Please donate to women’s causes, including Planned Parenthood and NARAL. 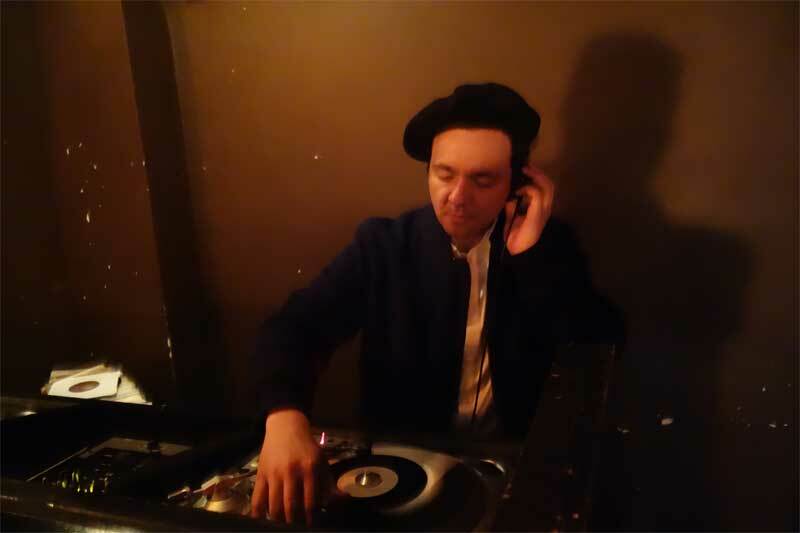 On Saturday January 12, Phast Phreddie the Boogaloo Omnibus hosted a happy hour swing session at the elegant Jupiter Disco on the outskirts of East Williamsburg. Or perhaps we should call it a Bat Bash, since there seemed to be a peculiar Batman theme! The Phast Man played the “Batman Theme” twice (once at the beginning of the night, and again in the middle), he wore his Bat Socks, the Bat Signal was projected on the wall behind the DJ, and the lovely Miss Nancy Gardner baked Bat Cookies! It was as if the Bat Cave had been turned into a groovy discotheque. Phast Phreddie the Boogaloo Omnibus displays his Bat Socks!! The Boogaloo Bag writers were very happy to see so many of their great friends at the Bat Happening, too. They all partook in the eating of the Bat Cookies and diggin’ the groovy sounds. For four straight hours, Phast Phreddie the Boogaloo Omnibus played his records: Some Mod jazz things, some funky things, some soul things, a couple of pop things, a few nice organ grooves, some things with Cuban rhythms–all of it groovy. Batman made a surprise appearance at the Jupiter Disco! When time was up, the night was still young. The Boog gathered up his records and Nancy gathered up the uneaten cookies. They then accompanied their friends Matt Clarke and Big Eugene on the L Train to Manhattan, where they all went to Otto’s Shrunken Head for Soulfinger, the great new soul dance party hosted by the DJs Connie T Empress and Girlsoul. There, Nancy put the cookies out and folks were happy to eat them. After about an hour or so, DJ Jumpy dropped in and he ate the last one. MMMMMM!!! Yummy chocolate covered Bat Cookies!!! None of these records are for sale. Some of them have clips to the youtubes–check them out on your own Bat Time! Phast Phreddie the Boogaloo Omnibus responds to the Bat Signal at the Jupiter Disco! Thanks to our pal Robbie Busch for the beautiful image on the poster. New Year’s Eve is a very special time. Very often folks go out to what should be a wild New Year’s Eve bash only to think back the next day about how ordinary the evening was. When hostess Lady Dawn decided to throw a New Year’s Eve Subway Soul Club event, she wanted to make sure it was not going to be just another Subway Soul Club event. She wanted a Happening! She called for a Black & White Ball–that is, she asked everyone who would attend to dress in elegant black and/or white evening wear. She dressed the venue, Ceremony, in black and white decorations and she called on resident DJ Phast Phreddie the Boogaloo Omnibus to enlist some fabulous DJs. Fabulous DJs for the Subway Soul Club Black & White New Year’s Eve Ball were One Mint Julep and Peanutbutter Brown. One Mint Julep swings at the Subway Soul Club New Year’s Eve Black & White Ball! One Mint Julep is a personality on radio station WFMU–where she is known as the Honky Tonk Radio Girl every Wednesday evening. We understand she also has a secret gig in the Gowanus Canal area that we are not supposed to discuss. However, she is also one of the resident DJs–with Mr. Fine Wine and Fancy Cat–at Soul Night, an outstanding Sixties soul dance party that has been successfully operating for five years. 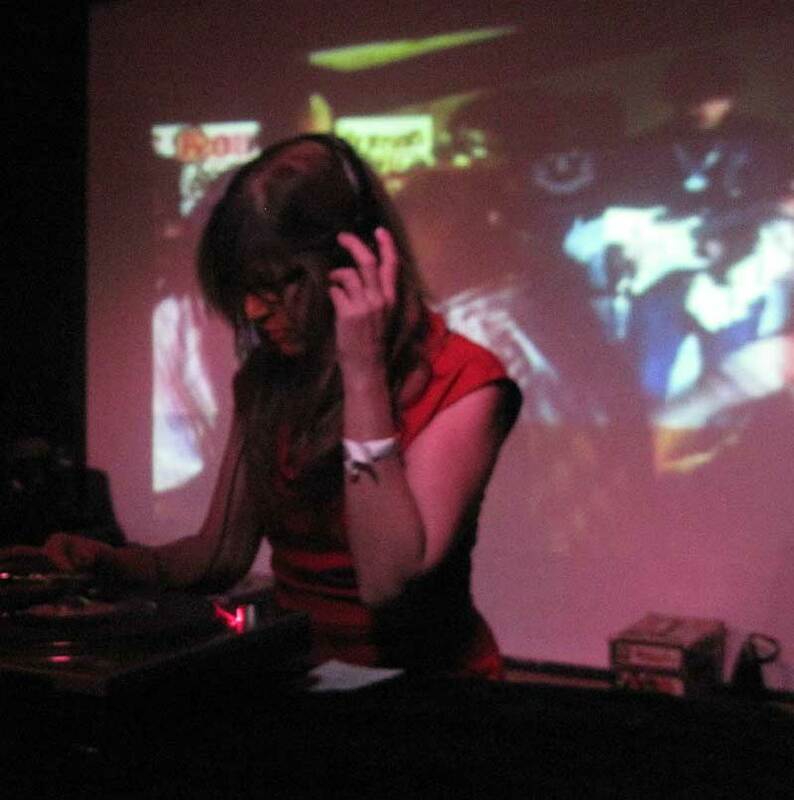 So you know she has boss records for Subway Soul Club–and she played them! Peanutbutter Brown gets visited in the DJ booth by a person who did not receive the “dress in black and white” memo at the Subway Soul Club New Year’s Eve Black & White Ball! Peanutbutter Brown is the most recent example of a Subway Soul Club attendee graduating to Subway Soul Club guest DJ. After being inspired by Subway Soul Club, he started his own Uptown Getdown several years ago. Then he moved to San Francisco where he initiated the Golden State Soul Club. He has DJ’d several events since moving back to the New York City area–and people dig his sound every time. On New Year’s Eve, Peanutbutter Brown got so carried away that he played “Testify” twice! Lady Dawn (on the left) surveys the groovy scene at the Subway Soul Club New Year’s Eve Black & White Ball! Ceremony–that intimate, dark bar off the beaten track in the middle of Williamsburg, Brooklyn–was all decked out with black, white and silver balloons; its tables covered with black and white table cloths; the DJ booth accented by a silver tinsel fringe; and black and white movies shown on the wall: Ready Steady Go’s Motown Special, James Brown Live in Boston, a groovy old movie featuring French models. Plus, Miss Nancy “Jeannie” Gardner baked chocolate crinkles and her signature vegan brownies for the event. The thing that really made the scene was the fact that so many people actually dressed up for the event–in black and white, fancy clothes, some with masks, and everybody with great big smiles as they danced out on the floor! More photos of the event were taken by Lady Dawn and they can be seen on her facebook site. Midnight was counted down and the club provided a champagne toast to keep spirits high. This was most definitely a New Year’s Eve to remember. Phast Phreddie the Boogaloo Omnibus endeavors to pick a top disk that all the kids will dance to at the Subway Soul Club New Year’s Eve Black & White Ball! None of these records are for sale. Some of them have links to clips on the youtubes. Get dressed in black and white before you click on them. Peanutbutter Brown, Lady Dawn and Phast Phreddie the Boogaloo Omnibus celebrate at midnight at the Subway Soul Club New Year’s Eve Black & White Ball! Thunder and Boogaloo Birthday Bash! Sophie Thunder and Josh Styles swing at the Birthday Bash! On Friday December 28, Sophie Thunder and Phast Phreddie the Boogaloo Omnibus celebrated their respective birthdays together at the Jupiter Disco, a groovy bar on Flushing Avenue on the outskirts of East Williamsburg. The affair started at six o’clock when The Boog set up and started playing records. Soon after, Sophie Thunder showed up with a box of records and her husband, Josh Styles–a most excellent DJ in his own right. He also appeared with a box of old 45s. Miss Sophie Thunder enjoys her Birthday Bash!! We were very happy to see so many of our lovely friends come to celebrate the birthdays of these two fine people. It helps that Miss Thunder and Mr. Styles live fairly nearby, as do many of their friends. The Jupiter Disco was packed out with folks jumping around to the groovy records, mostly played by Josh Styles, who took over the turntables at a couple of points, allowing Miss Sophie–who never seemed to have played a record!–and Phast Phreddie a chance to swing with their pals. Miss Nancy “Jeannie” Gardner arrived around 8:30 with cupcakes and little vegan cupcakes. Party hats were donned and merriment was had. The party ended promptly at ten o’clock, when the scheduled evening DJ showed up and played disco records that pretty much chased all the party-goers out to Flushing Avenue. The disco DJ seemed to have his own following, though, so the Jupe was never empty. Special shout out goes to our friends Yana Lil’Jerk and Quitty Tottenham who showed up after 10:00 PM and insisted to the DJ that he was not supposed to be there!!! The next day, Phast Phreddie pitched a softball game in the Parade Grounds at Prospect Park. What a way to celebrate a birthday–DJing with all your friends one night, playing a ball game the next afternoon. It’s good to know that at 65 that cat still does just what he wants to do!! Boss flyer by Josh Styles!